4 ingredients. 1 delicious dessert. Could it really be any better? Oh right, you could serve it and look like a rock star. Over a pot of simmering water, melt the chocolate and butter in a large bowl. Once fully melted, remove from the heat and slowly whisk in the egg yolks until smooth. Meanwhile, whip the egg whites until stiff peaks form (see our tip on how to whip egg whites for more information). Add the whipped egg whites to the chocolate mixture (always add the egg whites to the denser mixture, NOT the other way around) in additions of thirds to the chocolate mixture. To properly incorporate the egg whites, fold the egg whites into the mixture after each addition (see how to do this here). Fold in the first third of egg whites until fully incorporated, then repeat this process with the remaining portions of the egg whites until everything is incorporated together. To plate, place 3-4 raspberries in the bottom of the bowl. 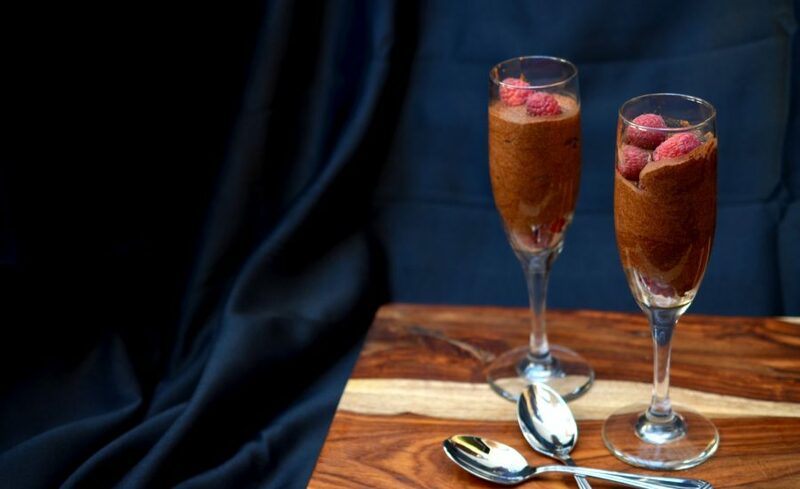 Top with chocolate mousse, add a few more raspberries and top with more mousse. Finish with a final raspberry or two as a finishing touch. Cover with cling wrap and refrigerate until ready to serve. ** Note: this recipe can be easily modified to serve any number of people. Allocate approximately 1 egg, 2 ounces of chocolate, 2 tbs butter and a handful of raspberries per a serving. Servings will depend on size of dish served in.